Cédric Douls, PSA’s head of international B2B operations, speaks exclusively to International Fleet World’s Curtis Hutchinson about the expanded group’s fleet plans for 2019. PSA Groupe has operated an integrated international B2B division since 2012 when Peugeot and Citroen’s global operations were merged. DS was added when it became a standalone brand and the division was significantly expanded last year with the addition of the newly acquired Vauxhall/Opel business, already firmly established as a major player in the international fleet market. 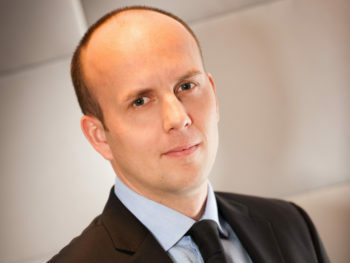 Cedric Douls joined PSA in 2010 and has worked exclusively across the group’s international operations. In 2016 he was appointed vice president of international B2B sales with responsibility for the group’s fleet operations across all six of its regions: Europe, Middle East and Africa, China and Southeast Asia, Latin America, India-Pacific and Eurasia. His brief is to look after three key areas of B2B sales: short-term rental, leasing and corporate key accounts. As an OEM what do you see as the main trends likely to shape the management of fleets across Europe in 2019 and why? Regulations in the shape of the Corporate Average Fuel Economy (CAFE) programme (European-wide legislation governing the average CO2 emissions of OEMs) on 1 January 2020 will have a significant impact on fleet planning in 2019. This is the main topic for 2019 as these changes will need to be anticipated and planned for together with our customers. PSA is working to electrify all its car ranges by 2025, whether it’s EV or PHEV, this needs to be prepared with our main leasing partners to produce TCOs because we have customers waiting to have greener fleets but would like them at the same price as today. Next year will be about looking at energy whether it’s EV, PHEV, diesel or petrol; they all have a role to play in fleet. There will be regulatory issues that also need to be addressed across other regions but as CAFE is European-centric it will not impact America, China, the Middle East or Africa. While other regions want to go greener they don’t necessarily want to go with the strict regulations that will come into Europe. Our main focus in 2019 will be to deploy international agreements across short-term rental, leasing and key accounts with all our international customers. However, there are challenges. For instance, in Latin America if you look at Brazil and Argentina, they operate very differently; Argentina does not have any international leasing companies because of the daily fluctuations of the interest rate, which is not the case in Brazil. So the B2B markets need to be treated differently. What will present fleet growth opportunities in 2019 for the PSA car brands? We have opportunities across all our B2B channels, we can always do better but not necessarily more. With short-term rental we are cautious about our volumes because it is important to protect our residual values. But fortunately we have opportunities across our six regions, especially with international key accounts, SMEs and leasing companies. And what are the opportunities for commercial vehicles? The same applies. In Europe with Peugeot, Citroen, Vauxhall and Opel the combined market share is more than 25%, so one in every four vans sold is a PSA model. That’s great but there is still space to grow because across Europe the biggest fleet companies, such as Engie, Veolia and Bouygues, are French and they are running a lot of LCVs and we already have a presence in them which means we can grow our market share even more. We will also be concentrating on SMEs because they are reliable customers with a lot of loyalty to our brands. Are there any fleet best practices that the established PSA brands can utilise from Vauxhall/Opel and vice versa? For sure. When you buy a company the natural feeling is that you apply what you’re doing to them. That was not the mindset we were in because Opel and Vauxhall are major forces in the B2B market, so I would say 50% of best practices came from PSA and the other 50% from them. The main topic was how to build this new PSA organisation. Not by selling more cars than we used to, as we’ve already sold these cars by being separate; the main issue is to build the future growth and productivity over the next five to 10 years in terms of tools, processes and guidelines. We have discovered that on some tools and processes we were better and others they were better. We have learnt from each other. How will the PSA model mix by fuel evolve in 2019 in response to fleet demand? In Europe the situation is chaotic. As an OEM we are a big industrial company. We cannot switch from petrol and diesel to EV and PHEV overnight because we have factories and supplies, so everyone has to get onboard and that’s difficult when some rules are changing every day. We know from our customers that they all want to go to cleaner fleets but we need to make the financial side work. We are working hard to achieve that. We are also finding the same in China where there is a growing desire to go to EVs and PHEVs. They are changing slowly at the moment but when they decide to move on emissions then it will happen quickly. How will PSA serve changing demands from traditional company car drivers looking at alternative Mobility as a Service (MaaS) options in 2019? When Carlos Tavares (chairman of the managing board) announced the Push to Pass plan in April 2016 he clearly stated that PSA would operate on two major pillars: the first one is as an OEM with an objective to be the most efficient; the second pillar is mobility. PSA will continue to sell great new cars. But mobility for us is also the ability to provide worldwide all the set of services linked to automotive mobility. We have invested in some mobility companies and we are deploying car sharing activities and have just launched our Free2Move service in Washington, as part of our re-entry into the US market. We are looking at a lot of solutions at the moment and we will bring more and more to our customers. The mobility market is growing significantly and will continue to do so in 2019. MaaS will increase but OEMs and other providers need to be able to make money out of it. MaaS will develop in 2019 and beyond, and PSA will be a major player.